• Once a stroke has been conceded it may not be declined or withdrawn. There is no penalty if a player continues to hole out after the concession, unless their stroke could be of assistance to their partner in a four-ball match, Decision 2-4/6. However, I would discourage anyone from doing so, as it may unnecessarily delay play. Obviously, if the player misses the putt it is of no consequence, because it had already been conceded. 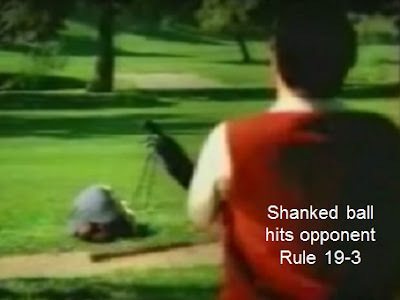 (iii) He gives incorrect information regarding the number of strokes taken to complete a hole and this affects the opponent's understanding of the result of the hole, unless he corrects the mistake before any player makes a stroke from the next teeing ground or, in the case of the last hole of the match, before all players leave the putting green. • If you make a stroke and your ball hits your opponent, or their equipment, you may choose to play the stroke again, Rule 19-3. This may seem unfair if you shank your ball sideways and it hits your opponent in their groin, or hits their trolley situated several distance away, but that is the Rule! Once you have made your apologies, you can either play the ball as it lies, or drop the ball where the previous stroke was made from, without penalty. • A four-ball partner may leave their ball on the putting green, e.g. in a position where it may usefully act as a backstop, while the other partner makes their putt. Unlike stroke play, there is no penalty if the ball in motion is deflected or stopped by a ball at rest on the putting green, Rule 19-5. Note that if an opponent considers a ball might assist the player making the putt they can demand that it is lifted, Rule 22-1. • If a match involving handicaps is all square after the stipulated round, the players should continue at the hole where the match began and the same handicap strokes should be allowed as in the stipulated round. • In a four-ball match involving handicaps, where a missing party is the person who the strokes allowance was calculated from, i.e. the lowest handicap player, the handicap strokes should still be allocated based on the missing person being present. • If a doubt or dispute arises between players in match play that cannot be resolved during play of the hole, a claim must be made before teeing-off at the next hole, strictly following the procedures set down in Rule 2-5. The player making the claim must notify their opponent that they are making a claim, agree the facts of the situation and make it clear that the Committee is being asked for a ruling. In many cases it will not be possible to obtain an official ruling in a timely manner. The match should be continued without further delay and played to a conclusion whereby there is a definitive result that takes into account an eventual ruling for the disputed hole, whether it be a win for either side, or a half. I recommend that every golf club or society obtains a copy of my 10-page eDocument, ‘So You Are Going to Play Match Play!’ I have recently added a single page, summary check list of 12 important points that all team members should be aware of before commencing their match. Purchasers have my permission to distribute this eDocument to any member of their Club or Society, providing it is without charge and my accreditation remains in place. Click here for details. “It is excellent and should be of great assistance to golfers of all categories. I like the way you’ve set it out, explaining all the relevant rules in sequence.” Ms. H.S. “Excellent document Barry. Your simple explanations mean that I learn more from your content that I do from the rule book!” Mr. G.C. “This is a must read for anyone that plays match play golf.” Mr. S.R. What's the reference for "Providing there is no agreement between them, one four-ball partner may leave their ball on the putting green"? I'm not aware that there's any problem with such an agreement. Thanks, John (and others) for pointing out this mistake.. I have since edited a correction above.